Minecraft has often been described as like virtual Lego and it looks like the Danish toy maker might just be running with that idea. 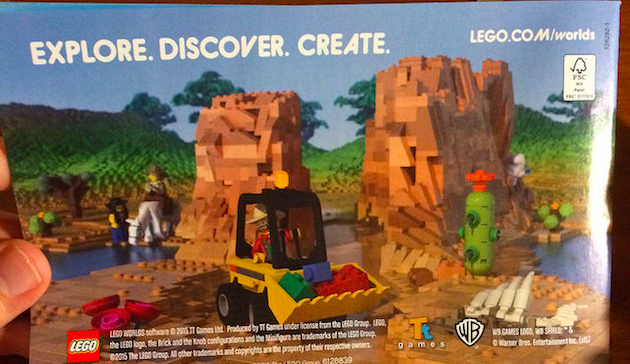 A member of the Eurobricks forum spotted an advert on the back of the instructions for Lego 60097 (the City Square kit) promoting an upcoming title from the company and WB Games called ‘Lego Worlds’. The invitation for players to”Explore. Discover. Create.” sounds very Minecraft-like, and Lego does have past form with building open-world style games based on its blocks. Back in 1998, the company released Lego Creator, which allowed players to create free form virtual constructions, and the brand is still alive in the Lego Creator Islands game for iOS and Android. With the E3 gaming conference coming up next month, it’s a fair bet that we’ll hear more about ‘Lego Worlds’ soon. In the meantime, we’ve prodded Lego in the off chance that it fancies spilling the blocky beans.